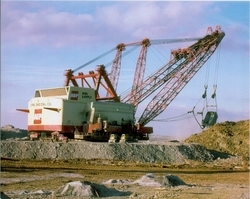 Bucyrus-Erie sales and publicity films from the 1960s and 1970s with original soundtracks show nearly all B-E construction and mining machines of the time in full color action. Big Muskie, Ruston-Bucyrus excavators, bucket wheel excavators, and hydraulic construction backhoes and cranes. 1 hr. 50 min.